As you build your business, good client communication is critical to your success. Count on us to support you with resources designed specifically for your practice, as well as access to investor-approved materials you can use with clients and prospects. 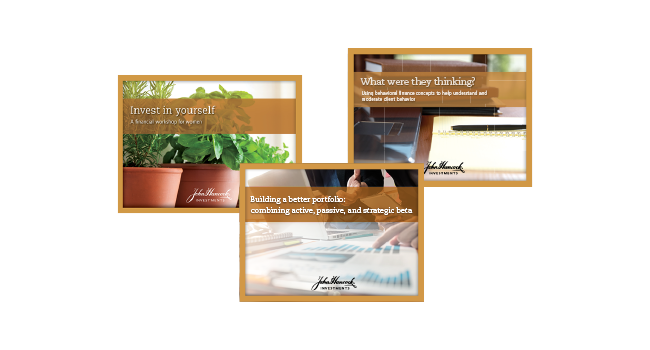 Talk to a John Hancock Investments Business Consultant about how we can help you take your practice to the next level. Communicating your value, our flagship, award-winning program, will enable you to confidently convey your value proposition and discuss your fees with clients while deepening existing client relationships and gaining significant net new business along the way. When it comes to better understanding the needs of investors today, we’ve got you covered. From portfolio optimization to behavioral finance, we offer a number of presentations that can help you keep your practice up to date. Plus, these presentations may help you earn continuing education credit. Get the 12- to 18-month outlook from our network of 75+ asset managers and researchers, available online and for iPad. A well-educated client is often the best client. 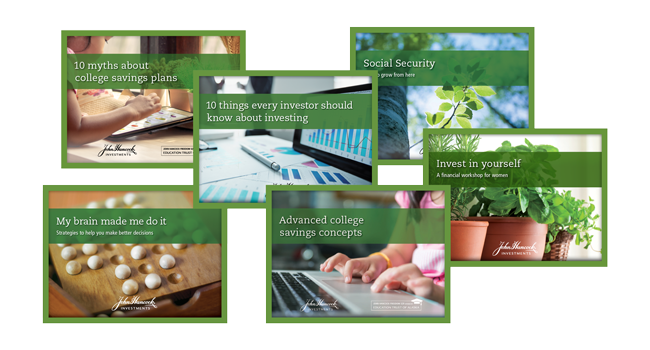 Our series of investor seminars will equip your clients with everything they need to know on a range of topics, from saving for college to drawing on Social Security. 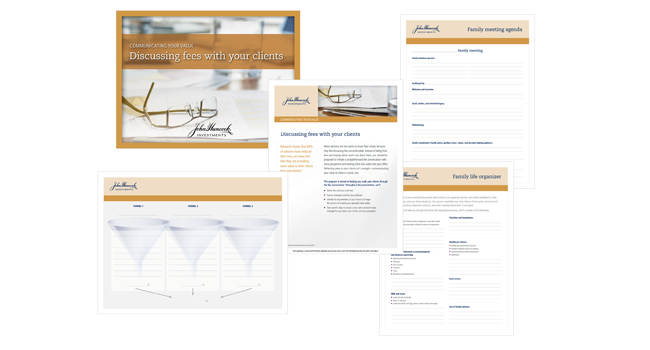 Financial advisors: Ask a John Hancock Investments Business Consultant for a review of how our practice management materials can help you build your business.